1. Be the Dad You Always Wanted. A lot of us don’t have fond memories of our father. I get it, but that doesn’t mean history has to repeat itself. You have the power to break out of that mold anytime you want to. You just have to want to enough to do something about it. So what about your dad rubbed you the wrong way? What did he do that hurt you mentality, spiritually, emotionally, even physically? It’s important you know what it is so that you can understand what has been programmed into your mind about what a dad looks like… so you don’t involuntarily fall into the same trap that he did. So if your dad was never there, then you need to go the extra mile to ensure your kids know that daddy will never leave them or forsake them. If your dad blew up in anger and said hurtful things to you and your mom, make sure you keep your anger in check and go overboard on praise an encouragement. Make strides in the other, positive direction. It is the best move not only for your kids but for you as well. It’s also important to envision the dad you always wanted and the dad you want to be. Dream about it. Have a vision for it. And then put it into practice in your home. You control who you are and what kind of father you are, not the imprint your father left on you. So decide to be the dad you always wanted and want to be and let that vision dictate who you are. 2. Know Your Deficiencies and Do Something About It. 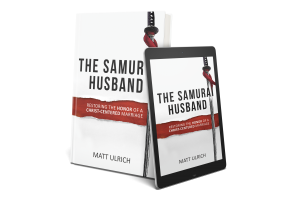 Great leadership books will tell you to focus on your strengths and build a team around you that can supplement your weaknesses, but that is the worst advice you can do as a father. You cannot outsource your role as a dad. Sure you can envision and make strides towards being the dad you want to be, but it is important to know what pitfalls await you. You need to be honest with yourself and acknowledge you have weaknesses and then start working on those weaknesses. So if your dad had an anger issue that you seemed to inherit, make sure you keep that in check. Have a plan for what you are going to do if you feel yourself getting out of control. Walk away and cool off. Seek the Lord. Whatever is going to get you moving away from those propensities. I know you come home tired from work and are exhausted, but you need to be fully there for your family. It may mean that you shift your priorities and instead of blowing all your energy at the office, you save some for when you get home. Jobs come and go but you only get one shot at your family, so make it count. Be fully there when you are with them. This means you need to check out from work when you are home to the best of your abilities. Get off your phone or blackberry. Put it down Golem! I know it’s your precious, but the world won’t end if you don’t check that email six times before your kids go to bed. Hate to break it to you but you’re not that important. Give your family your full attention when you are with them. There is no better gift that a dad can give! Be fully there and let your kids know that they have your full love and attention. Nothing is more empowering to your children than that. So be the dad you always wanted and wanted to be. Trust me, your wife and kids want the same thing! For more parenting advice, check out the parenting page!